A meteor exploded over western Cuba on February 1, 2019, and it delivered an impressive light show. The event was captured by numerous ground-based cameras. It was also spotted from space. 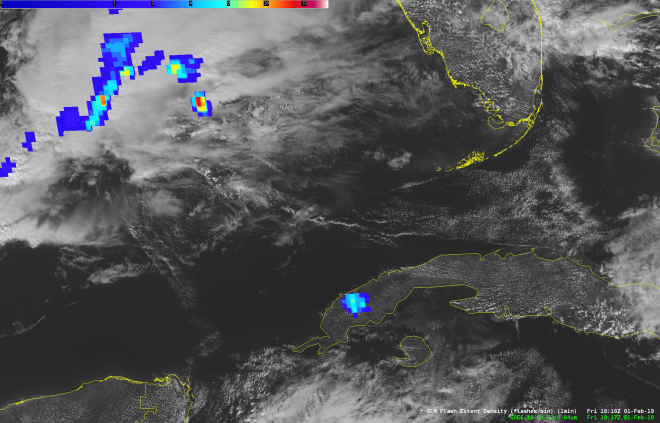 Researchers from the Cooperative Institute for Meteorological Satellite Studies wrote a blog post showing a series of images and data from the event, including the animation above. It was composed from false-color images gathered by NOAA’s GOES-16 satellite. (NASA builds GOES satellites for NOAA.) The dark blue pixels moving toward the northeast appear to be the signature of a debris cloud drifting in the atmosphere after the meteor exploded. A close look at visible imagery from GOES-16 reveals a shadow apparently cast by the debris cloud. This entry was posted on Tuesday, February 5th, 2019 at 5:57 pm and is filed under In Case You Missed It. You can follow any responses to this entry through the RSS 2.0 feed. You can skip to the end and leave a response. Pinging is currently not allowed.